Earlier in the year, Claire, Hugo, Evie and I visited Singapore for a family holiday and were blown away but what a great family destination it is. From outdoor adventures to interactive museums, here are five of the top activities that I’d recommend, as a father, for your Singapore holiday. Kidzania is located on Sentosa Island and is basically a gigantic indoor theme park built exclusively for kids. Unlike other parks, adults can’t participate in the activities at all – the idea is to empower your children to be independent. The world is scaled down kid size, has its own multi-story buildings, cars driving on roads, its own money and about 70 different careers for your children to experience firsthand. You’re probably wondering how can your kids experience a business – well that’s the wonder of KidZania, your children get to work in the businesses to understand what those types of careers might be like when they get older! I mentioned earlier that KidZania comes with it’s own money, well for good reason; kids earn different amounts of KidZone dollars for completing different jobs – just like the real world. They have to pay KidZone dollars to learn new skills. After finishing up at KidZania, your kids can take their cash and withdraw any in their “chequing account” via an ATM and spend some or all of their money at a KidZania shop, sound familiar? What I loved about KidZania was the variety of different careers, from window washers all the way up to complex professional industries like a doctor. I’d assumed that certain careers at KidZania would be overwhelmingly popular, however there were children spread out evenly across the entire theme park and it rang true for my children as well, Hugo liked being a pilot, Evie loved cooking pizza and they both loved washing windows – a new weekend pocket money opportunity there for sure! The ArtScience Museum is located in the Marina Bay Sands precinct, so if you’re in the area you need to put the ArtScience Museum on your list. Like the spectacular Marina Bay Sands hotel, the ArtScience Museum building is an architectural marvel, with a unique lotus flower design whose giant curved petals spread out before you. When we visited the ArtScience Museum, we explored an incredible, interactive exhibit called Into The Wild: An Immersive Virtual Adventure. To give you an idea of the scale of this art installation, it was a joint project between ArtScience Museum, Google using their Tango technology, Lenovo and WWF (World Wildlife Federation) in association with Panasonic and Qualcomm – say that five times fast! The exhibit spans multiple levels of the ArtScience Museum and over 1000 sq. meters, truly amazing. Visitors use a smartphone device to explore the ArtScience Museum. As you pan around the museum, everywhere you look through the handheld device shows the real museum, overlaid with a spectacular virtual rainforest for you to explore! There are animals running across the floor, climbing in the trees and creeping through the undergrowth! You can stop at any time on something interesting, tap your smartphone screen to get additional information about it and then continue on to the next part of your journey before ultimately completing your objective! To guarantee that you have enough devices, reserve your smartphone device in advance on the ArtScience Museum website. Make sure you’ve got your passport with you as you’ll need to provide it as security on the device, you’ll get it back when you return your device. I love the ArtScience Museum first and foremost because it was a science museum, I could spend hours on hours in there and not get bored. I enjoy taking Hugo and Evie to these types of activities because it broadens their knowledge and gives them another perspective, much like travel does. Each time we visit a science museum, both Hugo and Evie have an fantastic time, are energised and ask about 250 questions about all different aspects of the exhibits they experienced. Everything about the National Gallery in Singapore makes it a must visit. From the history of the former Supreme Court and City Hall which comprise the National Gallery, to the amazing architecture and of course spectacular South-east Asian art and culture, it’s a one of a kind experience! Claire, Hugo, Evie and I spent several hours inside and it wasn’t nearly enough, so give yourself plenty of time. The National Gallery has a massive floor space and we spent about half our time in each building, reading just some of the history of Singapore, visiting judges chambers, viewing traditional paintings and more. When our attention moved to the art side, the breadth of art was incredible, covering everything from paintings in various mediums, sculpture, 3D abstract installations, it was an absolute delight. One particular exhibit that both Hugo and Evie thought was very clever was a wooden chair that had been disassembled, cut into various pieces and ‘rebuilt’ over several meters. Of course, as you walk around the exhibit you can see what it is made of, but it doesn’t make sense entirely until you reach the viewing position and your perspective suddenly brings all of the individual pieces together to look like a perfectly normal chair. What I love about venues like the National Gallery in Singapore is the variety. As you walk through the gallery, your kids are looking at everything as well – make no mistake. They’ll pick up on different pieces of art or aspects of a specific piece of art that takes their interest and I think this is the beauty of it. Just like a science museum, an art gallery expands their minds to understand how art comes in many shapes and forms, not just the traditional that they might be more used to seeing. They come to understand that someone was passionate about that particular piece and poured countless amounts of time into producing it. East Coast Park is a 15 kilometer stretch of greenbelt with accompanying beach on the southern side of Singapore. It covers an impressive 185 hectares built entirely on reclaimed land. East Coast Park provides a huge variety of outdoor activities for the whole family to enjoy, from beach volleyball parks, BBQ pits, bike and rollerblading paths, skateboarding parks, water activities like swimming or cable skiing and much more. When we arrived at East Coast Park we grabbed a cold drink at a nearby McDonalds before setting off on our adventure for a few hours. We didn’t need to go far before we found a gigantic play area for the kids with climbing frames and huge slippery-dips. From there we continued along and came across bicycle rental. This was incredible if only for the simple fact that I’ve literally, never in my entire life, seen so many push bikes in a single place – there had to be over a thousand! We rented four bikes, different sizes and styles and set off on our merry way – hilarious because for a moment we tested the old expression it’s like riding a bike; but we got going and had a fantastic time riding around for the next hour or two. What I loved about this activity was we could all do it together, it wasn’t just Hugo and Evie or Claire and I, but everyone together. Anything outside is always a big plus in my book as well since everyone’s kids these days get too much screen time and reminding them that there is a big wide world outside that is fun to explore is great. Gardens by the Bay is an amazing venue built on 101 hectares of reclaimed land. If you don’t know about Flower Dome, Cloud Forest and the Supertree Grove yet, you certainly will once you start doing your research for your holiday to Singapore. What might not immediately capture your attention however is the Far East Organisation Children’s Garden, which is located near Cloud Forest. Within the Children’s Garden, you’ll find trampolines, balancing beams, hanging bridges and more. 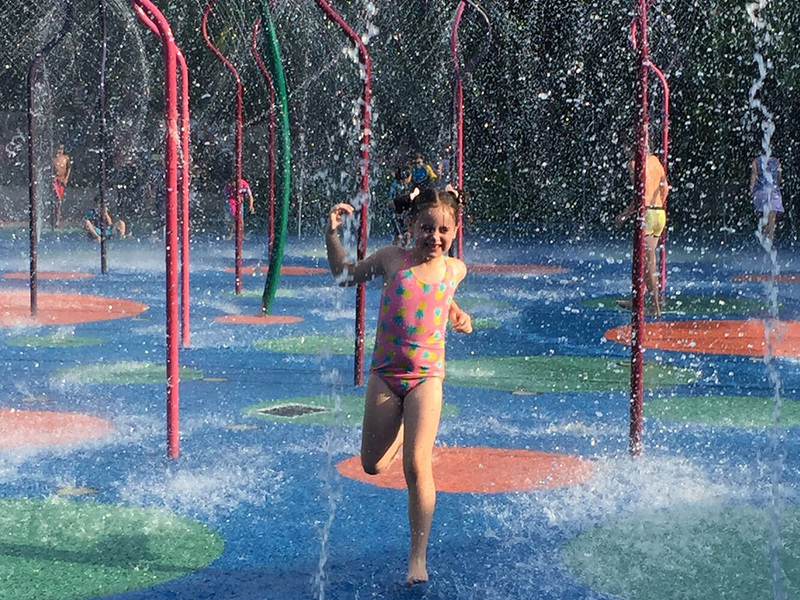 Importantly though, you should bring your kids togs along with you as they have an amazing water play area with jets of water squirting high into the air. All you’ll hear are the squeals, laughter and giggles from children from around the world having an absolute blast – best yet it is totally free! I loved that it was an outdoor activity and it was great to break up other sightseeing for some pure fun. Hugo and Evie ran around together in the giant jets of water, swinging around the poles and just having a riot of a time. Coincidentally, it was good timing from a weather standpoint, Singapore can be quite hot and humid so getting the kids into the water was an easy ask! When you’re planning your next Singapore holiday with kids, I hope you include a few of the activities above in your itinerary. While a destination like the National Gallery mightn’t normally make it onto everyone’s holiday activity list, I can assure you that you’re kids will thoroughly enjoy it and the world is there to explore – be adventurous, do something different and revel in something new! A revised version of this first appeared on the Expedia blog. Singapore. Everyone has heard of it, most know it as one of Asia’s massive financial hubs, as a spot for stopovers and business trips. But I suspect most wouldn’t have considered it as being a family friendly holiday destination. That all changed after I visited Singapore earlier in the year for a few days with Claire, Hugo and Evie. I’d now wholeheartedly recommend it to anyone looking for an amazing family holiday destination! Why? Let me tell you. Here are six reasons I think you should take your family to Singapore and why you’re going to love it as much as we did. From Darwin and Perth you can hop on a plane and be touching down in as little as 4 hours 30 minutes and 5 hours 30 minutes respectively. If you’re living down the east coast of Australia, major cities Brisbane, Sydney, Melbourne and Adelaide can reach Changi Airport between 7 hours 30 minutes and 8 hours 15 minutes. Right now you’re probably thinking that 7 or 8 hours on a plane with children is hard work, honestly it isn’t that hard. We left Brisbane mid morning, it was Hugo and Evie’s first time on a plane, so they were super excited about everything. In no time at all, they settled in with a movie or three, some music, a little gaming action on an iPad and before they knew it, we were landing late afternoon local time. Returning home, we left in the evening at 9PM local time so both Hugo and Evie were tired, not only because it was well after their normal bedtime but we’d had a full week of fun activities in Singapore. Within half an hour of taking off, both of them were snuggling down for a sleep and probably made it three quarters of the way home before they woke up, landing at breakfast time in Brisbane – a cinch! Make sure you have and use air sickness tablets with your children. We had them but didn’t use them as Hugo is normally fine with motion sickness. We thought we were in the clear, but the flight got bumpy and then the motion sickness started – it was too late! As a precautionary measure, grab a couple air sickness bags when you leave the plane – just in case! As Singapore is situated very close to the equator, the weather is pretty stable all year round. You can expect temperatures between 25c and 30c most of the year. Unless you’re living in North Queensland, you’ll definitely notice the increase in humidity as it sits over 70% most of the time. If you’re into the outdoors, you probably want to steer clear of late October through January as they are the wet season months where rainfall increases from around 150mm per month to over 250mm or an average of 25 days per month are wet in some way. The all year warm weather and much higher humidity that most are accustomed means it’s important to stay hydrated. We stayed at the Swissotel Merchant Court and they were happy to provide us bottles and bottles of cold drinking water each time we left the hotel – you just need to ask! Singapore as a country has approximately the same sized land area as the Gold Coast, but with a population of around 5.5 million. The relatively small land area and higher population means Singapore delivers great public transport – there are a lot of different train lines, plenty of buses and the taxis are cheap as well. While visiting Singapore, I was expecting to see huge volumes of traffic and congestion similar to Australia’s capital cities. I was pleasantly surprised. It turns out motor vehicles are extremely expensive. How expensive you ask, a VW Polo could set you back north of SG$85,000 (which is approximately the same dollar value in Australian dollars!) wowzer! In the week we visited Singapore, we tracked across most corners of the city and I don’t think it took more than 20 minutes to get anywhere – heavenly compared to Brisbane, Sydney or Melbourne traffic! Singapore is a melting pot of cultures, so like most developed cities you can eat virtually all cuisines without having to travel too far for it. In our time in Singapore, we ate outstanding food for dinner and visited China Town for what might be the best Asian food I’ve ever eaten. That right there is happiness on a plate, ohh and the coffee was outstanding as well! For lunch one day we stopped by Open Farm Community, Claire had saffron carnaroli risotto with chorizo, cuttlefish and green peas, while I had a braised lamb shank with couscous, olives and capers. In both instances the food was wonderful, Claire rated it as the best risotto she’d ever eaten and has referred to it several times since returning to Australia! The activities available in Singapore is where you’re really going to build memories that are going to last a lifetime for you and your family! Singapore Tourism Board has actually released a study, the first of its kind, that looked at how Australian families reacted emotionally to different experiences in Singapore. They used EEG Headsets to measure electrical brain activity at different attractions – giving them a guide to the family’s emotions. Fun, happiness, stress, interest, and importantly, excitement and relaxation! The results are pretty cool – turns out the key to a good holiday is to experience locations that are unique to that destination, like the Gardens by the Bay. Plenty of parents would avoid galleries and museums, thinking their kids wouldn’t have the patience – wrong! The study showed the kids and adults had peaks of “interest” at education-based activities. My pick is definitely KidZania, where kids get to play grown up in a wide variety of career simulations. The highlight that I think was a once in a lifetime experience was, at SIngapore Zoo. We had breakfast with a family of orangutans, fed giraffes by hand, got to see a whole variety of African pride animals like lions, tigers, pumas, rhinos, the cutest little monkey named a Tamarin and we fed elephants by hand, and much more – just incredible! Gardens by the Bay was also wonderful. By complete happenstance we arrived the week that the cherry blossom trees flowered within the Flower Dome. I’ve always wanted to travel to Japan to see the cherry blossom flower and now that I’ve seen it first hand, I completely understand the wonder and delight; Japan is now firmly on my must-travel-to destinations. It didn’t matter where we went while in Singapore, the people were wonderful. No one expects to run into unfriendly people when they travel but it does happen. In Singapore, at least in all the places we visited, the locals were great and it just made our time in Singapore even better. Our trip to Singapore was the best family holiday we’ve ever had. My wife Claire and I, along with Hugo and Evie had an absolute blast. My only complaint is that we weren’t there for another week to explore more, maybe take a couple day trips to Malaysia since it is close by as well. You definitely need to put Singapore on your family holiday destination list, you’ll love it! And for more info on Singapore, check out www.yoursingapore.com. A revised version of this story first appeared on the Expedia blog. I’ve seen some pretty impressive yo-yo skills over the years but this is a whole new level of skill. I love that he can perform tricks at different speeds, different lengths of string and even different speed and length on each yo-yo at the same time. I’ve been using a Head squash racquet for the last few years which I bought from Rebel Sport. In March this year I took a big swing at a ball, aiming to drive the ball back down the wall on full stretch and flat out misjudged my stroke and hit the wall, hard – so hard my racquet didn’t crack, it broke. I strolled down to Rebel Sport to replace my broken Head racquet and after a lot of fluffing about settled on a new brand I’d never played with before, Tecnifibre. My new racquet was amazing, entirely different to my old Head racquet and it was a thing of glory. Three weeks ago in a match I took another big swing at a ball and nicked the wall, no harder than I’ve nicked the wall a thousand times before but my new Tecnifibre racquet didn’t enjoy it at all – the tip of the racquet broke instantly. It was uncharacteristic of a squash racquet to break like that, so I called Rebel Sport and asked if I could have it replaced. Despite me owning it for about six months and having played with it a dozen times, they said yes! I should point out that squash racquets don’t normally come with warranty, in fact my Tecnifibre racquet has it written on the frame and yet Rebel Sport still replaced it. Unfortunately Rebel didn’t have the same model of my Tecnifibre racquet in stock and the only other ones in that brand were in the $250 territory, which I didn’t want to spent on a racquet. That didn’t faze Rebel at all, they were happy for me to replace my racquet with any other racquet of a similar value, so I’ve returned to Head. I know Rebel Sport didn’t have to replace my broken racquet but I’m absolutely stoked and totally impressed that they did. Since I had my original purchase receipt, getting it replaced was also a super easy process as well. Great customer service needs to be called out and I think this is a great example. World Rally Championship is an amazing motorsport series held around the world in some of the most exotic destinations. Since 2011, the WRC car specifications are a 1.6L, direct injected turbo charged engine with a maximum pressure of 2.5 bar through a 33mm air inlet, which limits power to about 230kW and 430Nm with a minimum weight of 1350kg . In this configuration, World Rally Cars are very, very fast as can be evidenced by the video below. Recently I watched a video on The Smoking Tire which showcased a young New Zealand rally car driver named Alex Kelsey who has manufactured his own WRC inspired rally car, yes you read that correctly – he built himself a world rally car. Unlike a World Rally Car, Alex’s creation didn’t have those same limitations – so he is packing a naturally aspirated 3.5L V6 from a Formula Renault that produces 335kW (450hp) and his car is more than 200kg lighter than a WRC specification vehicle. It hauls arse, 0-100kph in 2.6s and 0-200kph in 7.0s flat. I love the sound of it, it screams like an angry banshee and would make WRC even more of an awesome spectator sport – like when F1 still ran V10 and V12 engines!